This article is a must-read, just as the book is. I love a good satire, and I also love a good satire that is a slapstick romp at times. The characters are diverse in many ways, and I identified with more than one of them. I have now put all Libba Bray’s books on my TBR list. I read Beauty Queens in two sittings (it would have been one, but I started reading it the weekend after school started at 7:30pm, and you know how that goes, I was asleep with a book on my face by 8:30pm). I laughed out loud, read my husband certain lines, shook my head grimly at times, and at other points wrote down favorite lines. 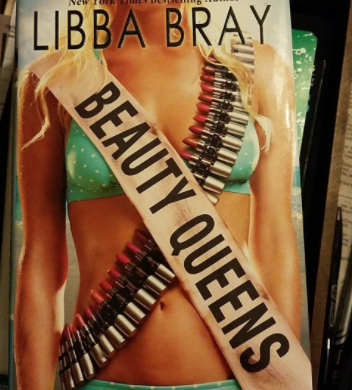 If I were still teaching The Lord of the Flies I would definitely be doing something to pair Beauty Queens with it, and talk about how books are always social commentary of the time in which they were written. Unfortunately, many of the issues in Beauty Queens are still issues. Also unfortunately for people who also might want to teach with this, there’s lots of language that might be considered inappropriate for schools. So if you need the kind of book you can sink in to and read non-stop, or if you need a break from all the lesson planning and grading (welcome back to the school year), or if you just want a funny book you can laugh out loud to and then immediately want to force all your friends to read, check out Beauty Queens. We’ve blogged before about the importance of reading diverse books. This summer, challenge yourself to read a book about an unfamiliar place, about an historical event you want to understand better, or by a new author. For example, this summer I’ve read a book about the Sri Lankan civil war, called Island of a Thousand Mirrors by Nayomi Munaweera. I had no idea the tension between the Tamil Liberation Fighters and the government. This lasted for 25 years. How did I miss this in history class or in current events? This book takes you in the the daily lives of people impacted by the fighting. It even gives you both sides, reminding me a little of The Association of Small Bombs. A third book I read this summer was The Gentleman’s Guide to Vice and Virtue by Mackenzie Lee. This playful YA romp/bildungsroman follows a privileged young man, Monty, his best friend, and his sister in the 1700s as they tour the continent before Monty must return to the responsibilities waiting for him at home. He’s a protagonist you’ll find flawed and frustrating at times, but since he seems open to change, you’ll stick with him to the end. As he slowly accepts his sexuality and his desire for Percy, he slowly understands both himself and the world. So try a new topic, a new author, a diverse book this summer. You may discover a new favorite author. A few years ago, I discovered the joys of reading from a Prize list, when I read a bunch of Pulitzer-prize winning plays (later this summer, I’ll be talking about that at the AP conference in Washington, DC). This summer, I’ve decided to dip my feet into a few lists: The Newbery Medal, The Printz Awards, and more Pulitzers. The Newbery Medal is given annually by the American Library Association “to the author of the most distinguished contribution to American literature for children.” Each year one book wins the medal and a few others are named as Honor Books, ones that had been considered for the medal. Some books you might recognize on this list include The Giver (1994), Holes (1999), The Graveyard Book (2009), and this year’s, The Girl Who Drank the Moon, by Kelly Barnhill. 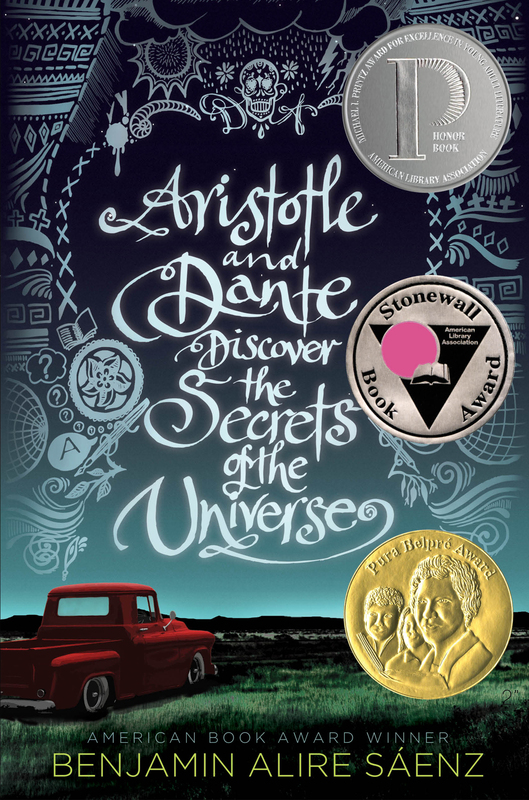 The Michael L. Printz Award ” exemplifies literary excellence in young adult literature.” Similar to the Newbery, one book wins the medal and others are named as Honor books. This year’s winner is John Lewis’s graphic novel March, Book 3. (I’ve read the first one, and really want to read two and three). Some of the books named as honor books this year include Nicola Yoon’s The Sun is Also A Star and Neal Shusterman’s Scythe. The Pulitzer Prize is awarded in 21 categories, but I’m most interested in Fiction, Drama, and Poetry. This year, Colson Whitehead’s Underground Railroad, Lynn Nottage’s Sweat, and Tyehimba Jess’s Olio were the winners for those categories (I’ve read the first two, working on the third now). We all have to-be-read lists that are miles long, but looking at a prize list and reading a few off that list can give you a good place to start if you’re interested in book recommendations for a level of reading you may be unfamiliar with.–the runners up are also phenomenal. If you’re looking to read more diverse books or expand your reading selections, these lists can be a great place to begin. PCTELA was awarded the Fund Teachers for the Dream grant this year! NCTE was extremely generous in awarding this grant. They’ve given us the opportunity to mentor three fabulous pre-service teachers from Pennsylvania. In this series you’ll hear directly from them about their experiences this school year with engaging students in discussions about diversity and self identity. They each used grant funding to develop and facilitate programs in their selected schools. One pre-service teacher chose to establish a book club with fifth grade students reading The Skin I’m In by Sharon G. Flake. Another chose to read, discuss, and create dynamic texts meant to guide students through tough discussions and self discovery. The third pre-service teacher offered movie nights to her high school students and used movies like Crash and Schindler’s List as spring boards for discussion. One of our mentors also wrote a blog post about her perspective, and that will be part of this series, too. Join us at our Annual Conference this October 20-21 in Greentree, PA to hear these three pre-service teachers give a panel presentation about their projects and what they’ve learned. I am uncomfortable writing or talking about the different shades of skin color. But the young African American girls in Daecia Smith’s book club were not. Daecia is a senior at Temple University, majoring in secondary English. She is student teaching this semester at a high academic performing school in Philadelphia. The afternoon I joined them at the elementary school in Philadelphia, Pennsylvania, for their book club I asked them two open ended questions: “How’s the club going?” and “How do you like the book you’re reading?” Like a fire storm, these 11 year old girls all spoke to me at once – eager to tell me about the book and the characters. 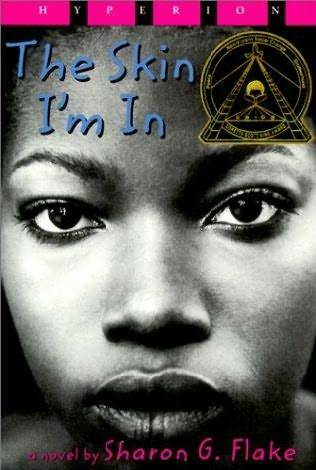 Aiming to be the one I heard, their responses became louder and more animated but they were all talking about the bullying going on in the novel, The Skin I’m In by Sharon Flake, and how it was all the about the lighter skinned character versus the darker skinned character. Without any inhibitions or fear of being politically incorrect they spoke to me candidly about the shades of being Black. The teacher in me wanted to connect to these free spirited little girls so I shared with them what I knew about shades of skin color. I recounted quickly as to not lose their interest – “I am of Italian American descent and Italian skin color depends on what part of Italy you are from. The southern part of Italy is very close to Africa so if you are Sicilian- which I am part of – your skin is darker. Some of my sisters are very fair but my father, brother and I have darker skin.” They weren’t interested or cared. I got it. I was this white lady talking about getting a tan. I never got the chance to tell them that my mother sometimes wore pantyhose to the beach because her legs were so white. The girls spoke with such confidence about shades of color that I asked them if they knew of this happening to people they knew or even themselves. With all of their heads nodding “yes” I realized why this was so important to them. Daecia gathered their attention back when she asked them to start reading. Having more girls than books they happily shared books and helped whoever was reading with words they couldn’t pronounce. They all followed along and listened carefully as their club members read. Daecia would stop and asked them questions periodically about what they were reading. It seemed more like a conversation than comprehension questions because this was obviously important to them. They read for about 30 minutes never inattentive or disengaged. Reading the right book – the book that means something to the reader- was the key. It was obvious they saw themselves in the characters they were reading about. At the end of the hour they cleaned up their snack wrappers (Daecia had provided snacks for them), collected the novels and journals. The girls put on their coats and headed out the classroom door. One little girl stopped and turned to Daecia and asked, “What are we reading next?” Daecia was exhausted from student teaching all day, and the extra hour she put in with these little girls, but she still managed a smile. The Selection is my favorite book series. With all the romance and drama, what teenage ​ girl wouldn’t love this book. It is about America Singer, just a regular sixteen year old girl living in a future society where, after World War three, the world is split up into castes: Ones being Royals, and Eights being the lowest in the system, the homeless. America is a five, which consists of entertainers like Musicians and Artists. 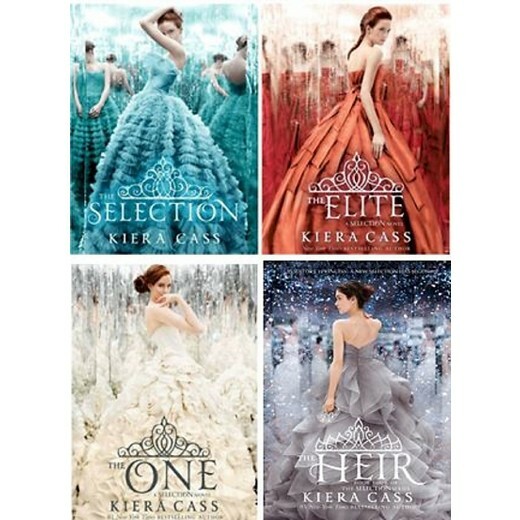 When America is selected to be part of a contest called The Selection to find the Prince of her country, Illéa’s new wife, her life is forever changed. America is unlike the other 35 girls selected, she doesn’t even want to become royalty. She likes her life the way it is, with her family, her jobs singing with her mom, and most importantly, her secret boyfriend, Aspen, who is a caste below her. But when America meets Prince Maxon, her whole perception of the fancy, stuck up prince, is gone. Instead she sees him for who he really is, funny, sweet, and kind. Will America choose Maxon and try to win the contest to become a princess, or marry her secret love back at her home, Aspen? I love this book for so many reasons. I’m not a fast reader, but I read the first three books in this series in five days, which for me, is very quick. I guarantee the dramatic love triangle between Aspen, America, and Maxon will make you laugh, cry, and scream at the book, all in the same chapter. The stink eyes and cat fights between the other competitors in the contest is another one of the many reasons you’ll never want to put down this book. I would recommend this series to most teenage girls, and honestly anyone who’s looking for a book with a big dose of drama. I re-read this book all the time, and it never gets old. I rate in 5 out of 5 stars. Sarah Kauffman is a seventh grader at Delta Middle school. In her free time she enjoys reading, writing, and theatre.